Many years ago, I found myself wandering the streets of Paris when a sudden storm hit. Already this had been the coldest, wettest, gloomiest summer Paris had seen in years, and the storm that afternoon was perhaps the most violent so far. 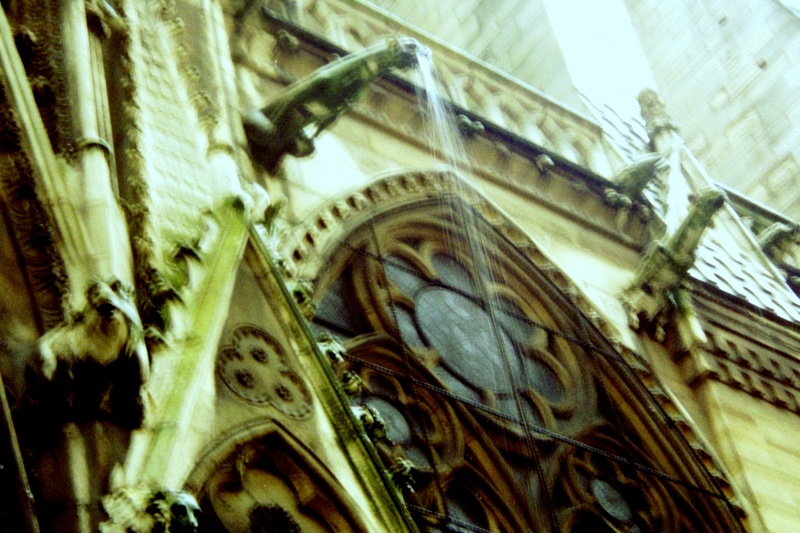 Soaked to the skin in minutes, no chance that my camera and other gear had made it unscathed, I plowed on through the rain to the Île de la Cité, where the Cathedral de Notre-Dame de Paris sits, looming, gothic, over the very heart of Paris. The Cathedral, a marvel of gothic architecture, required nearly 200 years to be built, beginning in the 12th century. 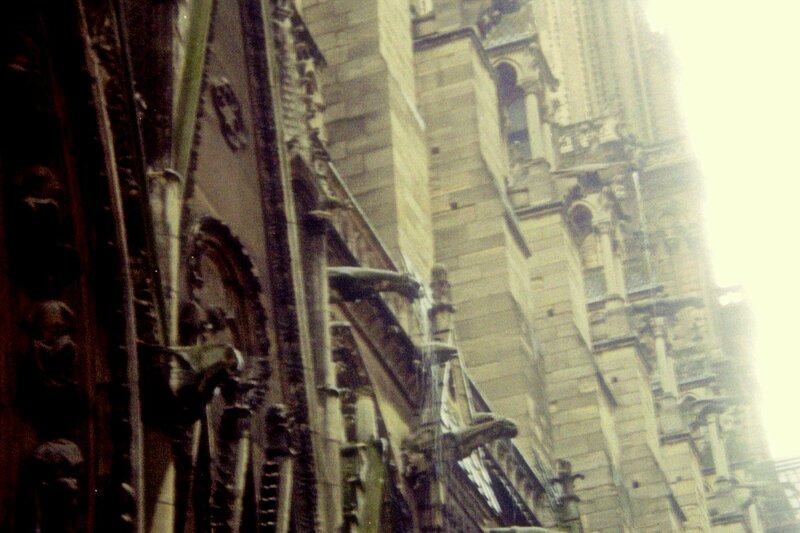 Its façade is a spectacle of carved stone: flying buttresses, saints, demons, martyrs, grotesques – the legendary chimères and gargouilles of Notre-Dame. Camera already drenched, I could not resist standing in the rain and capturing these magnificent devils as they spewed torrents of water across the slender arches of the facade. In the rain, the towers of the cathedral disappeared into the gloom. These stone grotesques, though common in gothic architecture, were condemned by some clergy as wicked idolatry. Victor Hugo was captivated by the intricate carvings, setting his tragic 1831 novel, The Hunchback of Notre Dame, within the cathedral, exploring themes of cruelty and redemption, public hysteria, witchcraft, and corruption among church members. In 1926, a mysterious author using the nom de plume Fulcanelli asserted that Notre Dame de Paris was nothing less than a “stone library” of the occult, depicting the secret of alchemy in the elaborate carvings of its façade. In all, nearly 2000 years of turmoil and unrest have swirled around this famous Cathedral and the land upon which it perches. 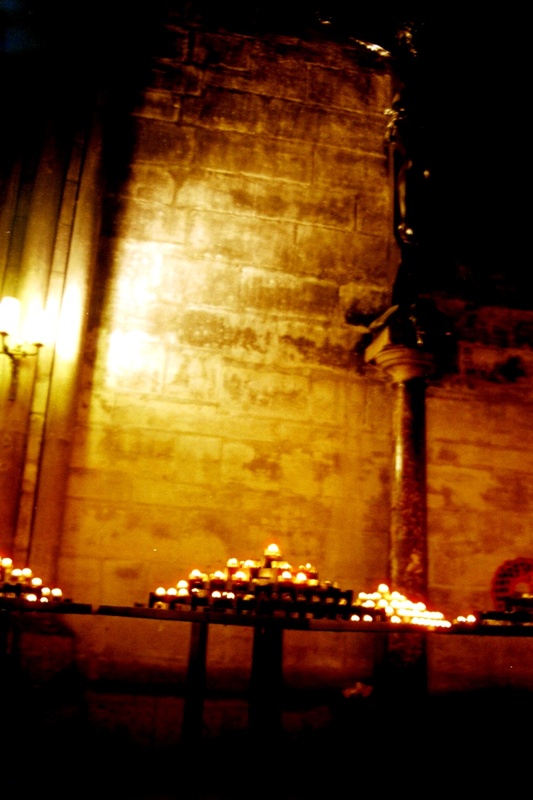 Descending over 250 feet below the shadow of the cathedral into the Crypte Archéologique, one finds the ancient, hidden heart of Paris, settled by Parisii in the 2nd century BCE, conquered by Romans in 52 CE, then repeatedly attacked by Vikings during the Norman invasion. Long the seat of Parisian government, this tumultuous location was identified as the site for the city’s grand new cathedral, Notre Dame de Paris, beginning construction in 1163 on a spot held sacred since Roman times. 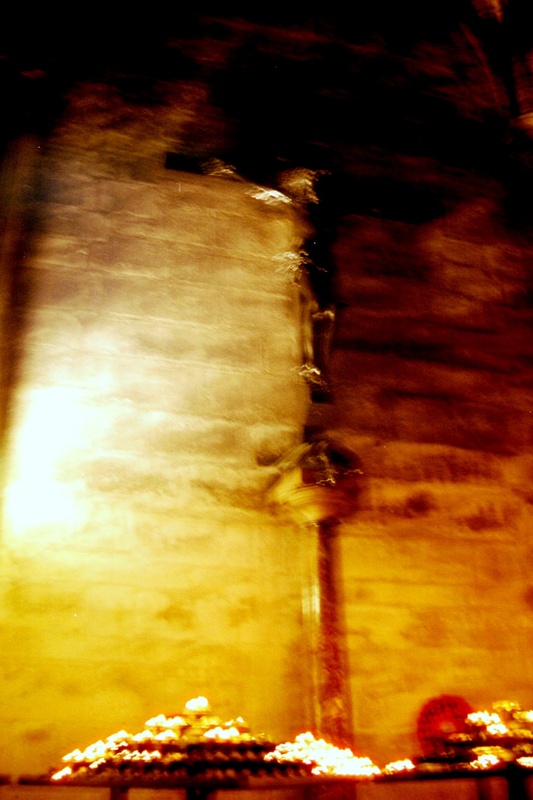 Is it any wonder that the cool air inside the cathedral seems to quiver, perhaps holding its breath for the unrest yet to come, perhaps in fear of what is already lurking within the dim heights of the cathedral ceiling, perhaps in the dark spaces below? Conflict and violence did not depart from this location once construction began. In 1185, standing within the still unformed cathedral, Heraclius of Caesarea called for the ultimately doomed Third Crusade. In 1450, during a bitter winter, a pack of wolves led by a giant beast named “Courtaud” slipped into the city and devoured 40 Parisians, before being stoned and speared to death by an angry mob before the very gates of the cathedral. The cathedral itself has been desecrated many times, notably in 1548, in the 1790’s (when the cathedral was rededicated to the Cult of Reason, and then to the Cult of the Supreme Being), and again in 1871, forcing several restoration attempts throughout the cathedral’s tumultuous history. 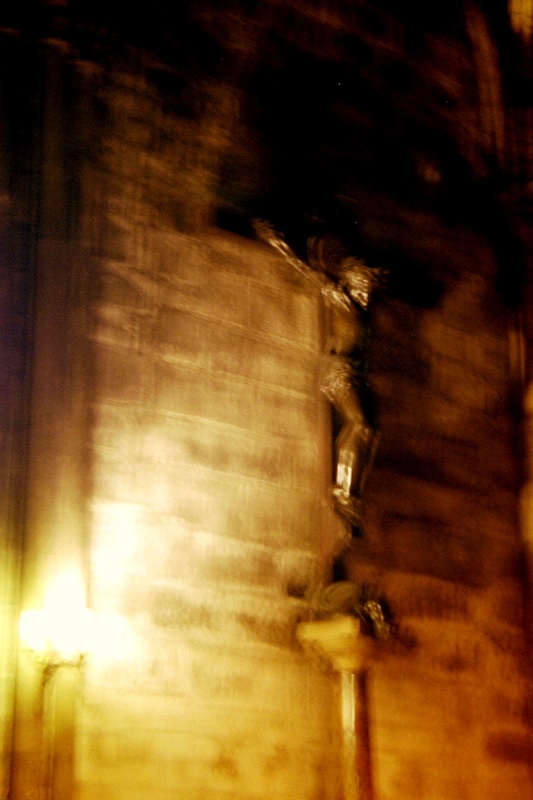 If you approach the Cathedral from the northeast, via Île Saint-Louis, you will cross Pont Marie, a bridge said to be haunted by the ghost of a woman frozen to death during World War II, left waiting on the bridge for a husband who never came. 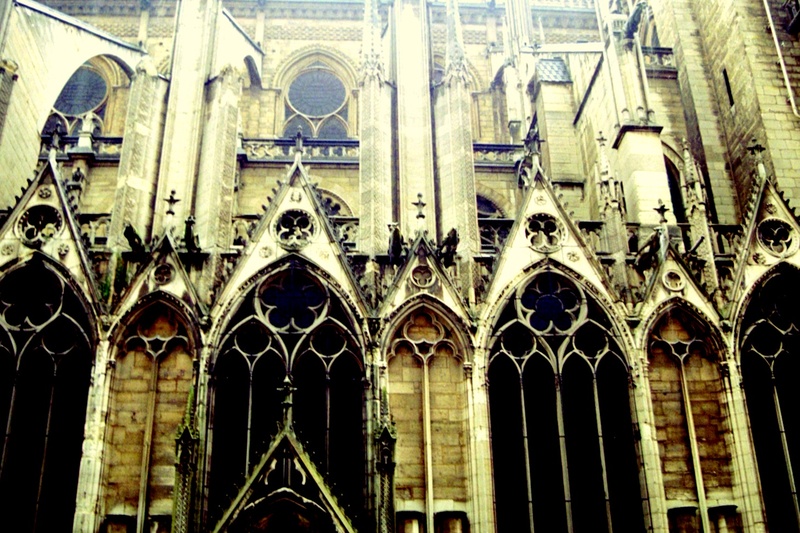 This cathedral, Notre Dame de Paris, with its dark spires, skeletal ribs, and “strange savage lions…monsters…half beast, half man,” witnesses to two centuries of dark history, surely holds a high and unique place in a city known for haunted spaces, executions and murders, revolutions, cemeteries, gothic buildings and miles upon miles of unexplored underground crypts. While I do not know what form this year’s Halloween haunt will take, I am certain that these gothic images, captured in the dark and fog of a dreary day, will provide some spark to fire the imagination. I was particularly intrigued by this sentence: “In 1926, a mysterious author using the nom de plume Fulcanelli asserted that Notre Dame de Paris was nothing less than a “stone library” of the occult, depicting the secret of alchemy in the elaborate carvings of its façade.” I would love to explore & possibly discover the secrets hidden within this monument’s walls! This building is really tremendous. On a clearer day, I once climbed to the top of the church and stood with the gargoyles that peered out, pensive, over the whole of the city.